Born on the 31st of August 1946, Thomas Richard Coughlin is a famous American Football coach, particularly known as the coach of the New York Giants in the NFL. So how much is Coughlin’s net worth? As of early 2016 it is reported by sources to be over $16 million, gained mostly from his long standing coaching career. Growing up in Waterloo, New York, Coughlin’s love for football started when he attended Syracuse University. While earning his degree in education, he played football alongside the legendary Larry Csonka and Floyd Little. In 1970, his coaching career started with Rochester Institute of Technology serving as their head coach. After three years, he left the team and moved to his Alma matter, Syracuse University where he served as a quarterback coach. Coughlin left Syracuse in 1980, and claimed the same position at Boston University, helping the team win two bowl berths in 1982 and 1983. The following year up until 1985, he served as receivers coach of the Philadelphia Eagles, and in 1986 worked with the Green Bay Packers. His stints in various colleges built his name in the football world and also increased his net worth. In 1988, Coughlin went back to New York to help the renowned coach Bill Parcells coach the New York Giants. After helping the team until 1990, he once again left and moved to Boston to coach the Boston College Eagles. Coughlin overhauled the team and led them to three successful seasons. 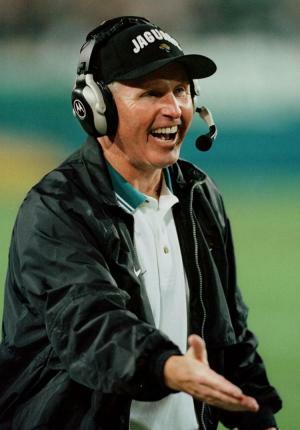 With his outstanding run with the Eagles, Coughlin’s name blossomed and he was hired as the first head coach of NFL expansion team the Jacksonville Jaguars in 1995. After only two years of its existence, he led the team to its first American Football Conference (AFC) in 1996 and once again in 1999. Because of Coughlin’s efforts, the Jaguars were considered the most successful expansion team in history, but after eight years, he left the team. In 2003, he was once again back in New York, to be the head coach of the New York Giants. Though the team endured some ups and downs, Coughlin led the team to two Super Bowl Victories making him one of the most well-known coaches of all time, and increasing his net worth considerably. Their first trip to victory came in 2007; even though the giants had a rough start, they were able to beat the Tampa Bay Buccaneers, the Dallas Cowboys and the Green Bay Packers on their way to Super Bowl. Finally, they defeated the favoured New England patriots in Super Bowl XLII. The two teams had a rematch after five years, but the Giants once again won, the 2012 Super Bowl XLVI, also making Coughlin the oldest coach to win a Super Bowl. After over a decade, in 2016 Coughlin resigned from the Giants. In terms of his personal life, Coughlin is with his wife of 49 years Judy; together they have four children and eleven grand children. The couple now resides in Park Ridge, New Jersey. He also created the “Tom Coughlin Jay Fund Foundation” or more commonly known as Jay Fund, to help children with leukaemia. 1 Father-in-law of Chris Snee. 2 Doug Flutie's QB coach at Boston College. 3 Officially stepped down as head coach of the New York Giants. Coughlin finishes his Giants head coaching career with a 102-90 record, including defeating the New England Patriots in Super Bowl XLII, and Super Bowl XLVI. He was Bill Parcells's wide receivers coach when the Giants won Super Bowl XXV. [January 4, 2016]. 4 Teammates with Larry Csonka and Floyd Little on the Syracuse University football team. 5 Head coach of the New York Giants from 2004-2015. 6 Head coach of the Jacksonville Jaguars from 1995-2002.